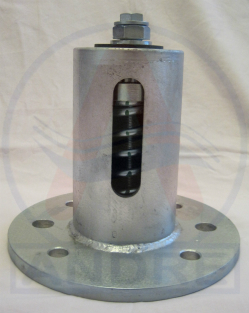 SS-1-200 Seismic spring mounts have a heavy duty steel spring isolator unit with built in all directional snubbing. This model is designed to withstand seismic forces of approximately 2G even at maximum rated load, making it suitable and safe for most critical applications (including zone 4 areas). Input seismic force of 2G is the highest input magnitude ever recorded anywhere in the world. The snubbing element is made of high quality neoprene. The housing is made of steel with rugged zinc metallized finish. The springs are galvanized, instead of being painted, to prevent rusting in the long run. Seismic spring mounts model SS-1-200 series are suitable for 2" deflection. 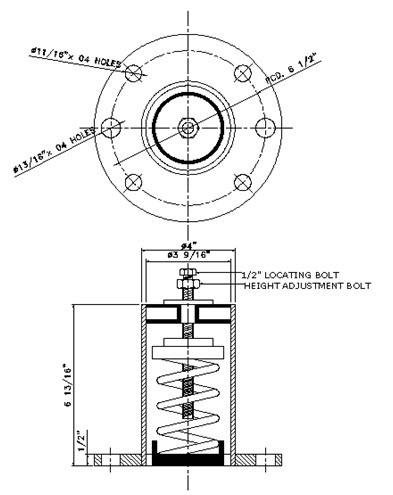 These spring mounts are recommended when the building is critical from a vibration point of view and when negligible vibration transmission to the building is permitted. * G-Rating is based on attachment to steel. For concrete, the ratings will be controlled by the attachment method and the concrete strength.